Apple Cider Vinegar has many health benefits, and it is a valuable part of any healthy diet. Our Apple Cider Vinegar capsules are highly potent, and contain a wide range of helpful ingredients. Lose weight and feel better with this all-natural supplement! Many people take Apple Cider Vinegar for weight loss because of its high potency. As a natural appetite suppressant, this product helps control sugar cravings and keeps you full longer after meals. It boosts your metabolism and increases satiety, making it a great fat burner to add to your diet. Get a great figure naturally with this product's help! The health benefits of Apple Cider Vinegar are impressive as well. It is good for supporting digestion, with its natural detox and cleanse properties. It also helps in breaking down proteins, and research shows that it may control blood sugar after eating. Bio Sense is your trusted source of natural health supplements. Our products are made in the United States by GMP certified facilities, using only the purest ingredients. You can count on the quality and potency of our supplements, which we back with a 100% Money Back Guarantee. 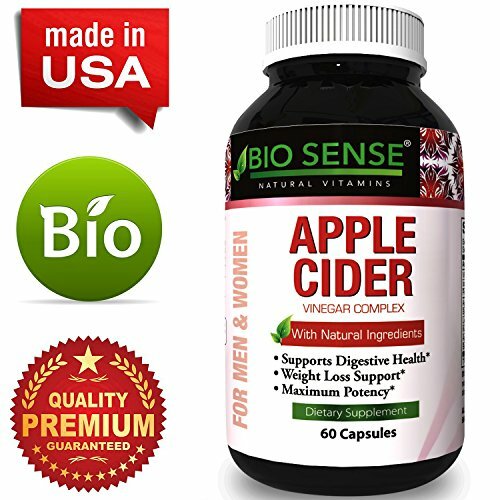 Vegetable Capsules - Our Apple Cider Vinegar supplement uses fast dissolving vegetable cellulose capsules for better bioavailability. This makes our product more potent than other Apple Cider Vinegar tablets, chewables, liquids, or drops. Made in America - All supplements sold by Brandon Sciences are made in the United States. Our products are manufactured by GMP certified laboratories, and are backed by a hassle-free 100% Money Back Guarantee. Shop with confidence!